For women struggling to conceive, in vitro fertilization can be a successful, but also fairly expensive, option. At approximately $15,000 per cycle, and requiring two cycles on average before it works, it’s still beyond the reach of many couples. A new app called Conceivable, launching today, is offering a different option. 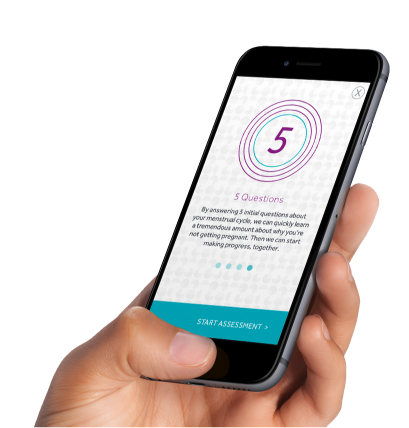 This subscription-based service delivered through a mobile application is a personalized health program for women that works to identify and address a variety of underlying factors that could be contributing to the issue at hand, and then drop-ships supplements to their door every month to accompany their customized health plan. The program itself originally began in a fertility clinic out in the offline world. Before starting Conceivable, founder and CEO Kirsten Karchmer founded and ran the Texas Center for Reproductive Acupuncture, a large fertility wellness clinic in the U.S. She also served as the president of the American Board of Oriental Reproductive Medicine. During her clinical career, Karchmer developed a system that integrated a number of different data-backed strategies to help improve women’s fertility, including those involving conventional medicine, Chinese medicine, nutrition, behavioral science and more. The program also looks for a variety of underlying factors that are unique to each woman which, combined, can affect fertility. These could include things like caffeine intake, alcohol consumption, exercise, diet, smoking, stress levels, irregular cycles and more. As an example, Karchmer explains that many women don’t realize that if they have a short cycle – 26 days or less – they have a 50 percent less likelihood of conceiving compared with women who have longer cycles. In Conceivable’s program, there are some 50 similar factors that are taken into account in order to build its customized program. But the program doesn’t stop at identifying the potential causes; it also offers strategies to help address them. For example, Conceivable will offer its customers personalized meal plans, recipes and shopping lists to aid with their nutritional changes, as well as mind/body exercises, stress management plans, lifestyle recommendations, plus proprietary blends of herbal supplements that arrive monthly. This is combined with the typical cycle-tracking that’s offered today by a number of competing apps on the market, including the Max Levchin-headed fertility app Glow, that’s backed by a hefty $23 million. But Glow’s business involves offering the digital version of fertility-tracking techniques that have been around for some time, including things like basal temperature monitoring, weight monitoring, ovulation tracking, and more. Previously, women just printed out spreadsheets and tracked this data for themselves. Glow, however, combines this tracking with a program that women can pay into monthly and then get a share of the pool after 10 months if they still can’t get pregnant. Conceivable, meanwhile, has a different model. It charges $199 per month for access to its service, which puts it well above the price of free cycle-tracking apps, but far below the cost of actually working with a fertility clinic directly and receiving personalized care. What’s more, the Conceivable program changes over time. Using adaptive learning software, the service is designed to improve and optimize over time, adjusting itself to the user’s progress and data input. At the clinic, the program was used with 7,000 couples, and around half got pregnant. But Karchmer says that the analog version can’t be compared with the digital counterpart, because some of those women also used assistive technologies in conjunction with other lifestyle changes. However, in the four months the Conceivable app has been in beta testing with 100 users, two have gotten pregnant, she notes. Of course, it will take more time and additional data to know how well her program compares with the success rates of others. But for women looking for additional options, it’s one they may choose to consider before taking the final step of opting for in vitro. Based in Austin, Conceivable is backed by $800,000 in seed funding from various angels and former VCs – including around one-third of whom who were prior customers from Karchmer’s clinic. Conceivable is initially available on iOS, with plans to support the web, mobile web and Android in the future.